My friends grew tired of me trying to coordinate our plans so that we would be in Hongdae for this infamous soiree. After a few missed dates due to conflicting dinner plans and bad weather I thought it just wasn’t meant to be. 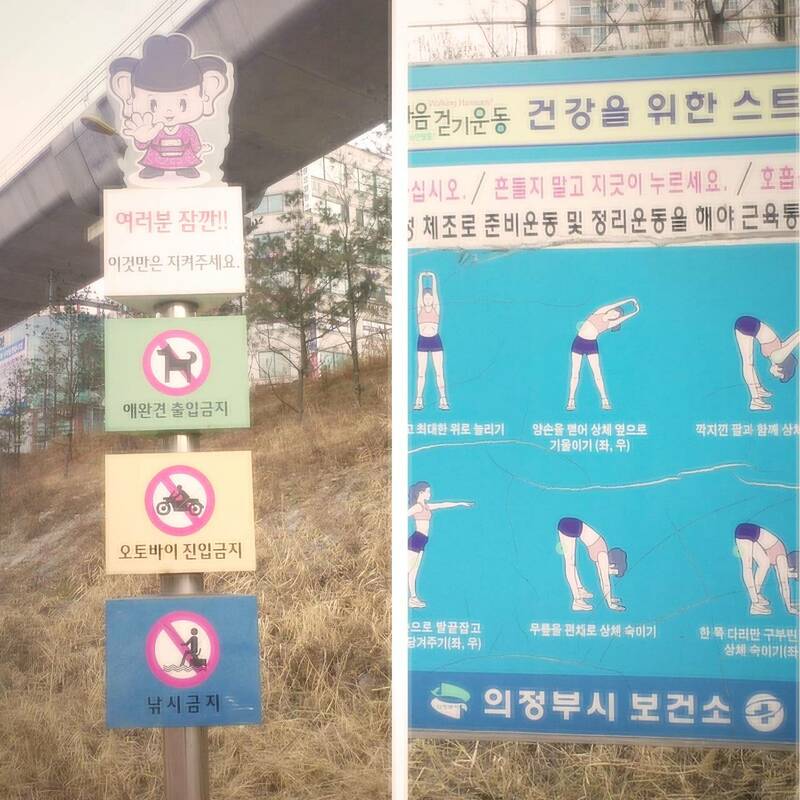 With just over a month left living and teaching in Korea, I eyed my Korea Bucket List with satisfaction and shrugged off the 2 scribbled words in the bottom right hand corner: Silent Disco. You can’t do it all… Or can you? And then, as life goes, when I wasn’t looking I full on stumbled into a quiet mess of headphones, swaying bodies, balloons, and all sorts of dancing. 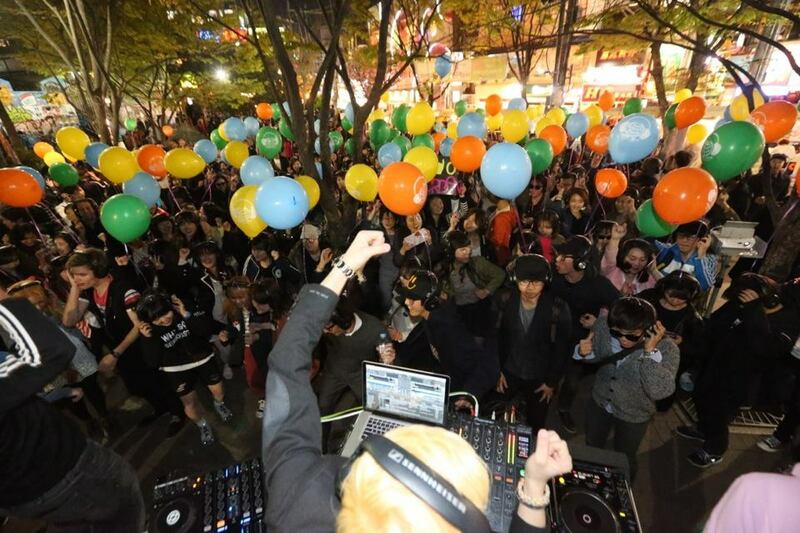 The Korea Silent Disco is widely known in the city and has helped to make the Hongdae playground a fantastic meeting place for friends and those looking to enjoy the fresh air, the talented local performers, and of course the cheap convenient store beer and soju. The Silent Disco is not exclusive to Korea. This type of party is widely known around the world and it is a disco where people dance to music listened to on wireless headphones. The DJ’s music is broadcast via an FM-transmitter and the disco-ers wear headphones that pick up the signal. We found our way to a small booth where a handful of Korean women, who I swear were K-Pop stars, took our money (about $4.00) and IDs and issued us bulky headphones. For the next few hours we danced and admired the diverse crowd of dancing Koreans and foreigners. Each disco participant seemed to have a different style of dance, but no one seemed to mind. Between every few songs I managed to let the headphones slip down to my neck and I relished in the peaceful party that surrounded me. It’s a very strange feeling to experience a full-blown dance party with no sound. Although I thoroughly enjoyed the disco, I believe the oblivious people passing by got the real show. They curiously laughed and pointed at us and some dancers kindly allowed the strangers to wear the headphones for a brief few moments. Toward the end of the night the disco leader led the party out into the streets. 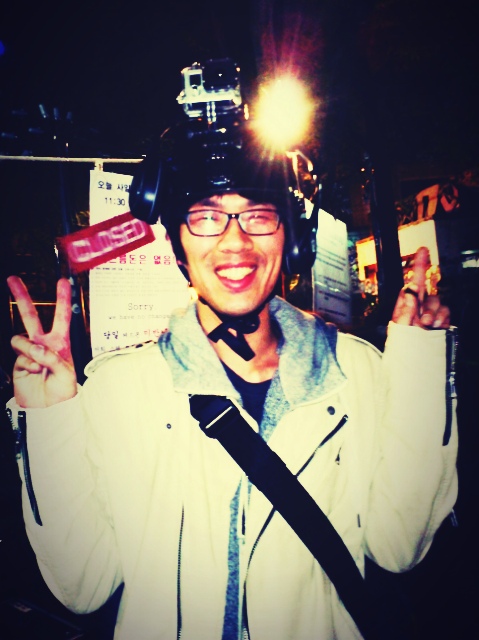 We followed him as he dodged inbetween traffic, past packed restaurants, and through the busy shopping alleys of Hongdae for what is called an ‘open air love parade’. This night was a quiet one, but one I will surely not forget anytime soon. 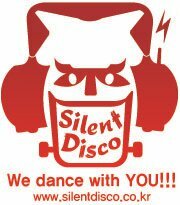 Make sure to check out the Silent Disco Korea Facebook page for their monthly party dates and times. 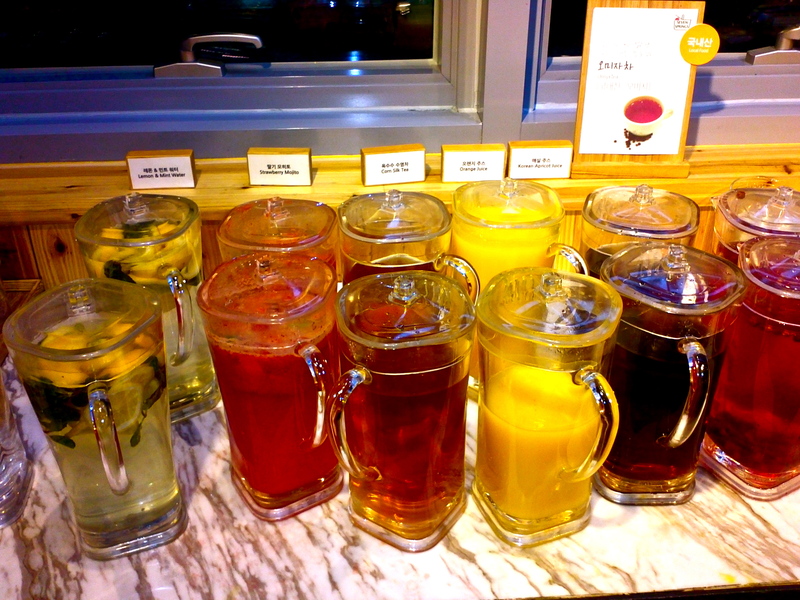 I promise, you have room for this one last thing on your Korea Bucket List. I quickly ate my words, along with a mountain of deliciousness. Seven Springs is glorious. It boasts a passion for seasonal, local, homemade, and environment-friendly food. This is not just another picked-over buffet with cheap fried food and soggy pizza. 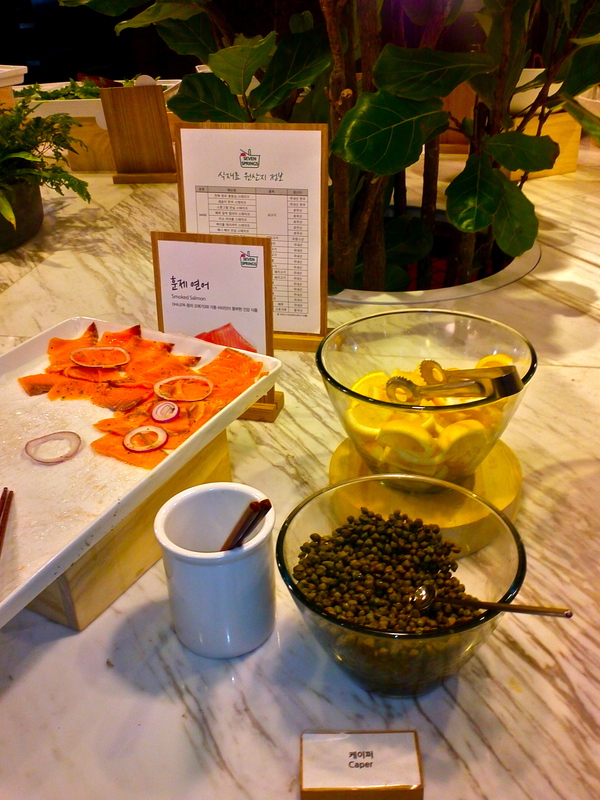 The food is healthy, fresh and the vegetables are actually delivered every morning to the different restaurant locations. 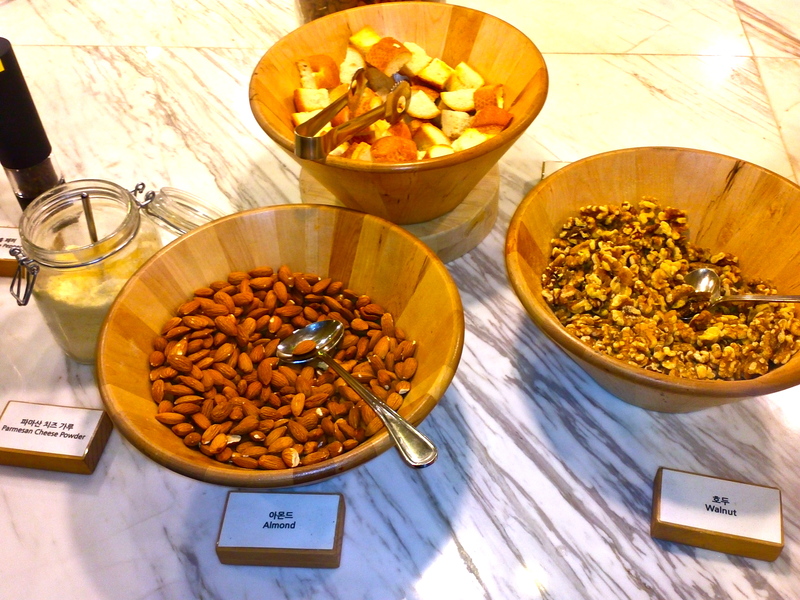 You can order meat and other things for the table to share, but I recommend just going with the standard salad bar. There are separate lunch and dinner prices. I admit the prices are a bit steep, but I think the food’s taste and quality are worth the money spent. 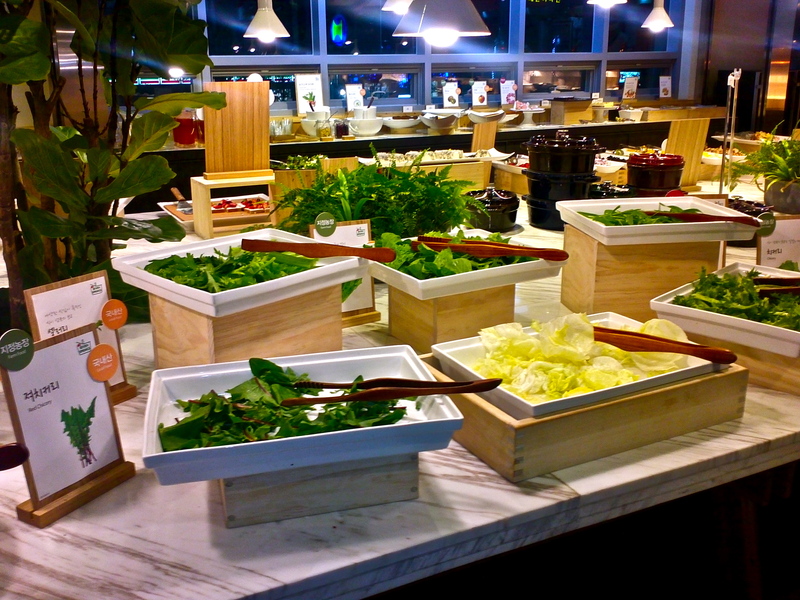 The salad bar option also includes hot food items (think: baked pumpkin, pastas, honey bbq chicken, corn on the cob, pizza, and more) appetizers, dessert (think: ice cream, green tea cake, and yogurt parfait), drinks (think: mint and lemon infused water, berry, and non-alcoholic mojito concoctions to quench your thirst). I piled my plate high with some strange combinations. I jumped for joy when I spotted capers (CAPERS! ), green olives, various leafy greens, homemade salad dressings, avocado (the real deal), bowls of walnuts and almonds, and corn on the cob. 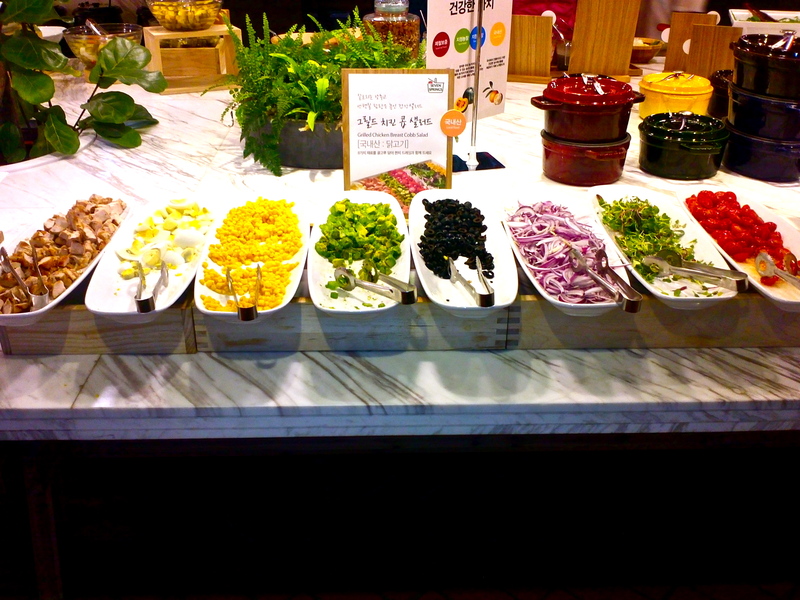 I recommend Seven Springs for vegetarians in Korea, but I also think anyone who needs a green fix or appreciates fresh food will leave this place smiling and planning a second Seoul Salad Soiree. I’m all about the music. I am up for any concert, just ask. With only a few days left before I leave (tear tear), lately I’ve been reminicing about all I’ve managed to experience while teaching and living in Korea (Are you ready?). I am amazed at how much I have done in such a short amount of time, especially when I think about all the concerts I’ve attended. It seems like ages ago, but at this time last year I was preparing to witness Lady Gaga’s first and very controvercial world tour stop in Seoul. A short while later I joined happy-go-lucky young Koreans lounging on Nami Island for the annual Rainbow Island Festival with Jason Mraz as the headliner. A friend surprised me the next month with tickets to Korea’s famous pop music countdown show, Inkigayo. I was able to live out my childhood TRL dreams and be schooled in K-Pop all in the same day. Later in the summer I hopped from one stage to the next at Super!Sonic where I was able to inch my way to the front of Foster The People, Gotye, New Order, The Vaccines and other stages. 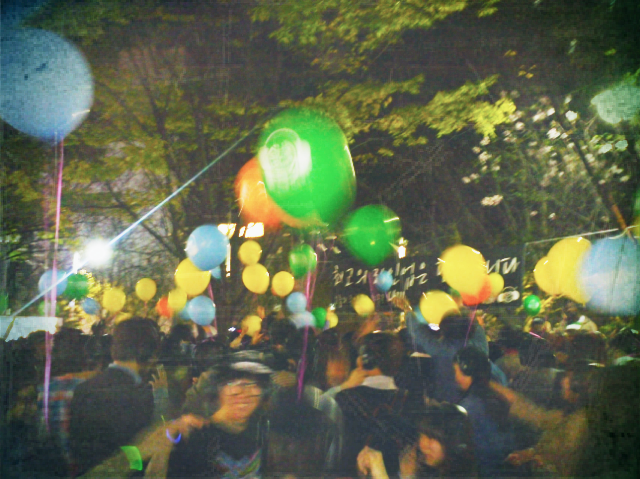 Also, during the summer and fall I spent many a weekend night with a beer in hand in Hongdae park where young creative college students performed for large spontaneous crowds. 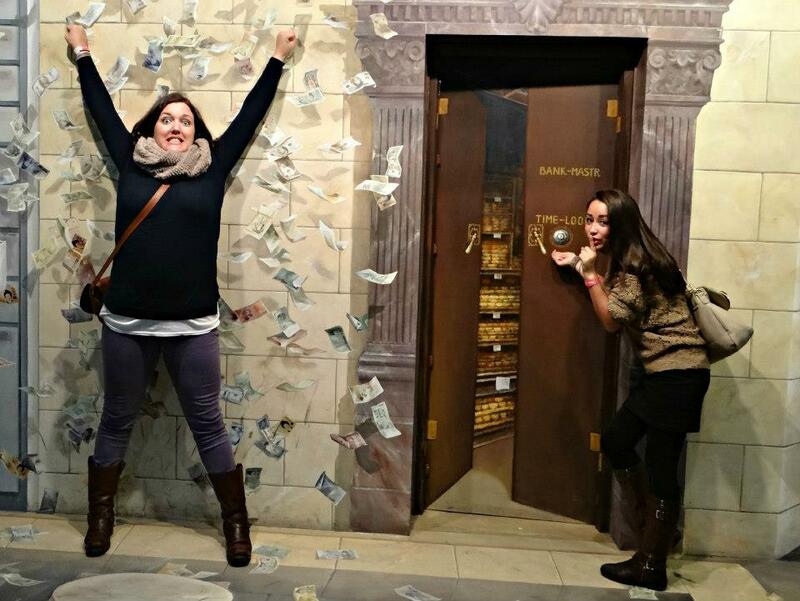 Oh, and how could I forget, I basically had a date with Psy last fall. He paid for everything, soju was chugged, and his shirt came off. After stumbling out of Hongdae’s Rolling Hall a short time ago with ringing ears and sore feet I sadly realized this particular night probably marked my last big Korea concert. But I couldn’t think of a better act to end with. Claire Boucher (aka Grimes) is a Canadian musician who has learned to successfully mix just the right amount of electronic pop with beautiful vocals to create dance-worthy and uplifting beats. Her Seoul trip was a special one becasue she is a huge K-Pop fan and apparently a few big Korean names, including G-Dragon, were present at the March 23 show. I may have a year or so on the small yet fiercely blonde music-maker, but her stage precense was uniquely uplifting and powerful. I think one reason I enjoy live music so much is that I love witnessing people doing the one thing they are meant to do in life. Grimes is a musician and she is made for the stage. I left the show with a desire to continue dancing and an even stronger apprecition for my decision to wear flats on this particular night. Here are a few resources you should check out to ensure you do not miss the next big show in Korea. So many fantastic acts grace Korea with their presence each year, you just have to be on the look-out for information regarding each show. 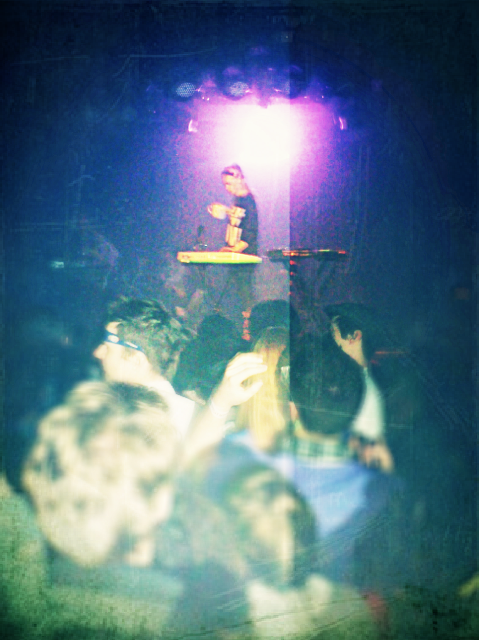 1) SuperColorSuper ‘makes concerts’ and brought Grimes to Seoul. Check out the other shows they are working on here. 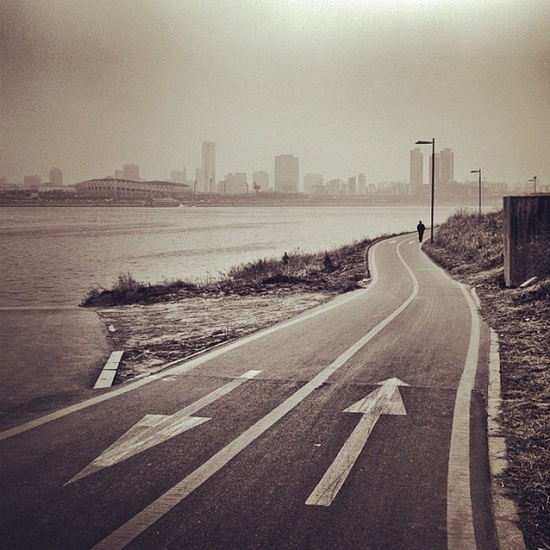 2) The Korea Gig Guide is a great resource for small and big acts performing in Korea. While browsing this guide last year I stumbled upon the Lady Gaga show information. You can also skim it before venturing out on a Friday or Saturday night to see which bars will have live music. 3) Interpark is kind of like the TicketMaster of Korea. I used this site to buy Super!Sonic, Lady Gaga and Rainbow Island Festival tickets. The site is easy to navigate and you can sign up for emails to inform you of upcoming shows. August: Super!Sonic will return this year, but the specifics have yet to be released. Keep an eye on this page for more information and don’t miss it. 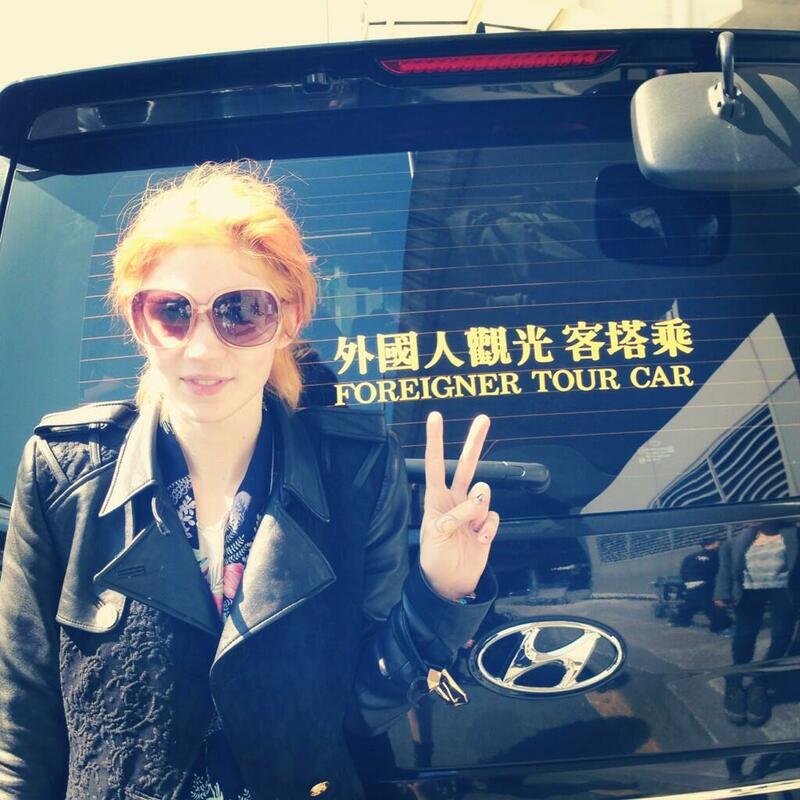 Let’s shop ‘Folk Style’ in Seoul. 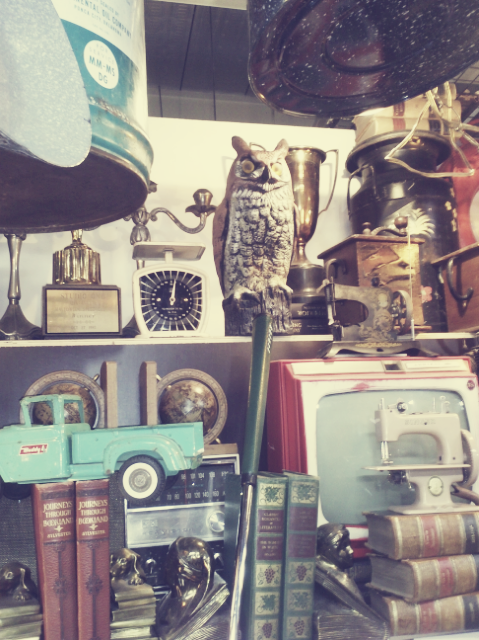 Once upon a time the Seoul Folk Flea Market (서울풍물시장) vendors set up shop around the Cheonggyecheon Stream in Seoul, Korea. Now they return each day to well-manicured squares of space within a recently built warehouse location. Some merchants refer to the market as The Ant Market due to its many moves over the years. Thankfully, a friend who is always in the know dragged me to the market a few weeks ago. I am very glad she did. 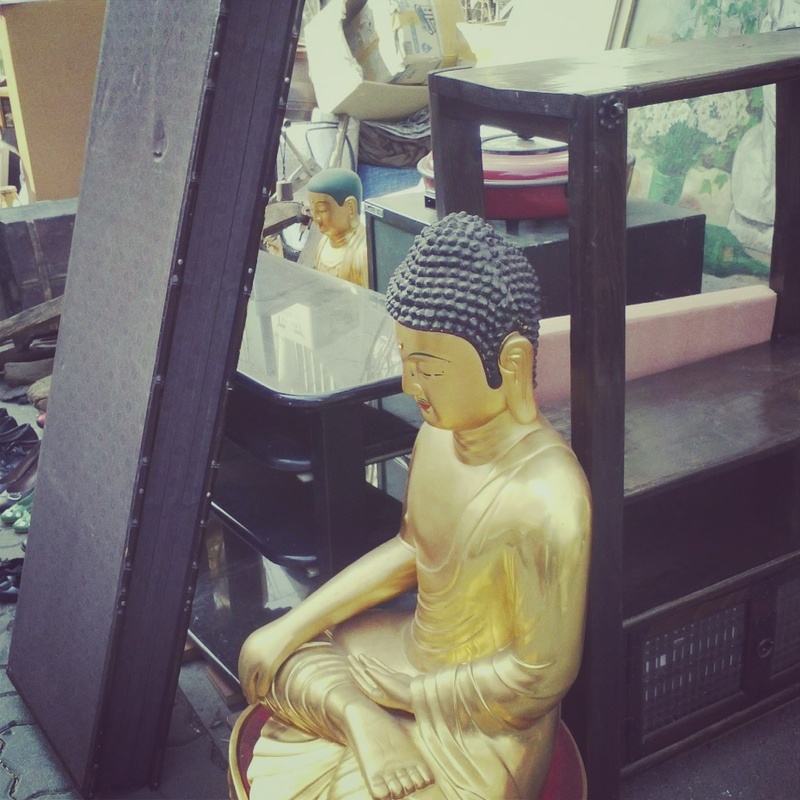 The vendors hope to keep the culture of the traditional market alive and the newest location is well-organized with maps and signs leading shoppers through a maze of small shops selling everything from Buddha figurines and wooden masks to designer handbags and musical instruments. With only enough time to discover the first floor of the massive market, I found great Korean souvenirs, a vintage pair of Ray Bans and a slouchy black leather bag. I will be back soon to tackle the second floor. 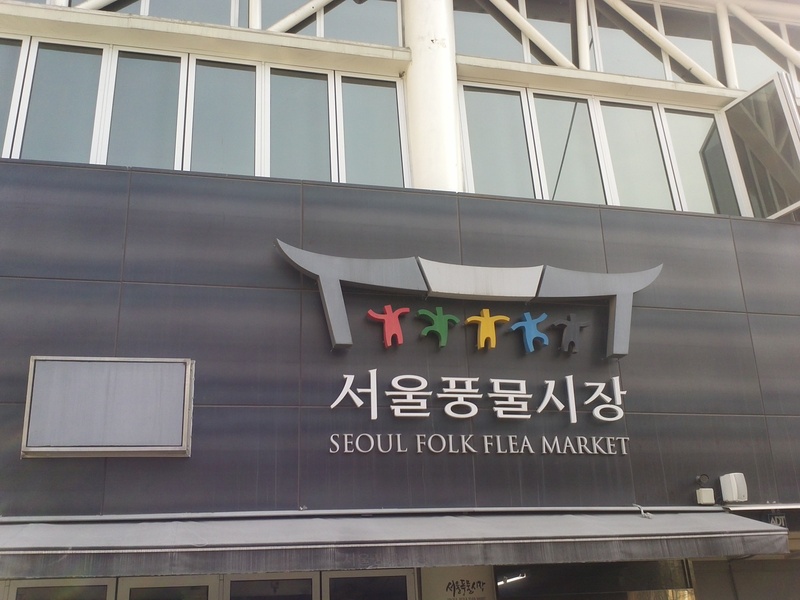 Have you visited the Seoul Folk Flea Market? 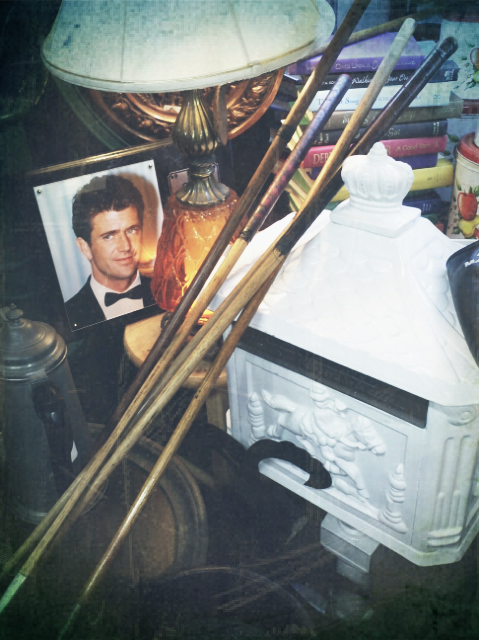 What great finds did you come across? 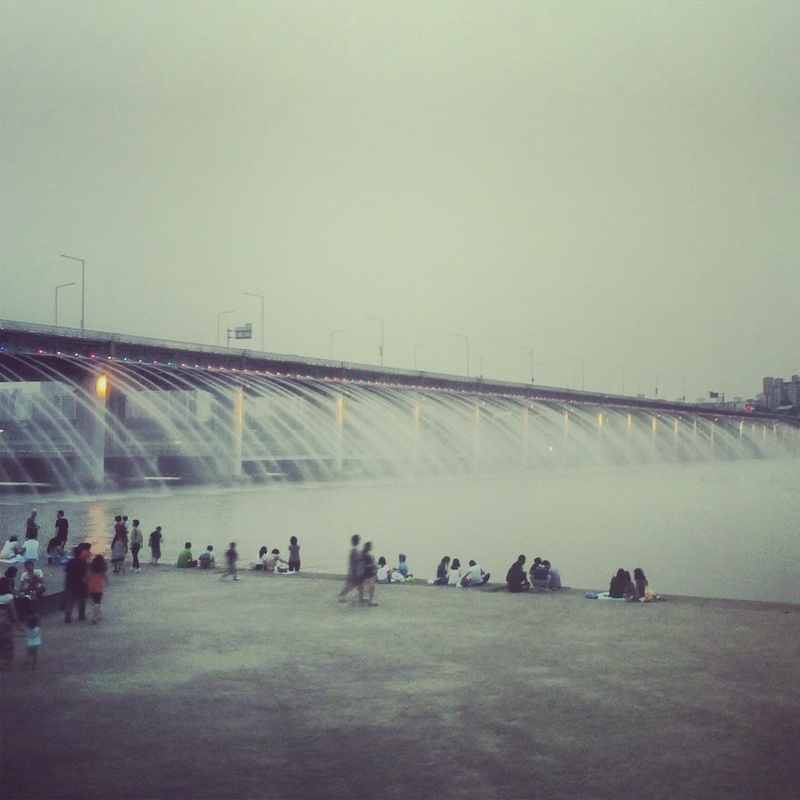 The Banpo Bridge is home to the world’s largest bridge water fountain show. Arrive around dusk and enjoy the multicolored show of lights and water. It is amazing, this picture from last summer doesn’t do it justice! 2) Walk, run, or roller-blade – just get out there and be active. 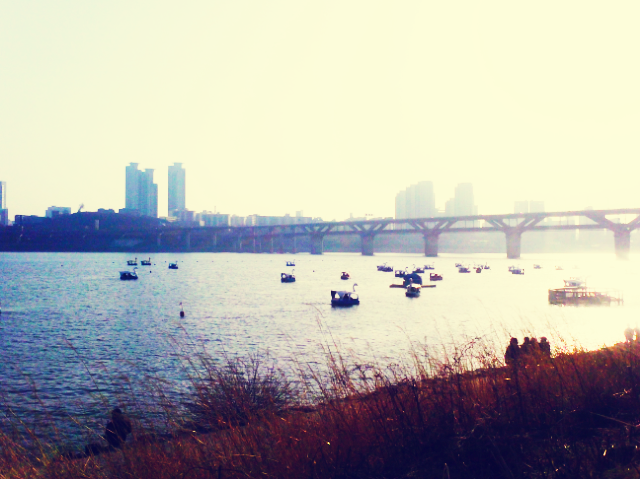 You will feel 100x better after an active river excursion on a day off from teaching English in Korea. 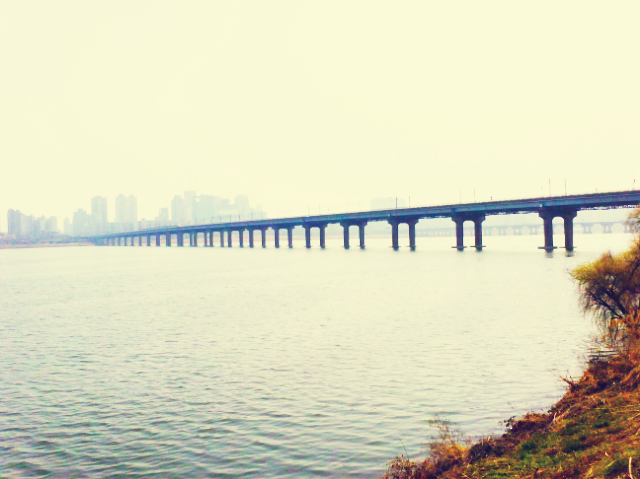 Separate pedestrian paths line both sides of the river and you can cross the water at various bridges. 3) Yes, those are floating islands in the river. 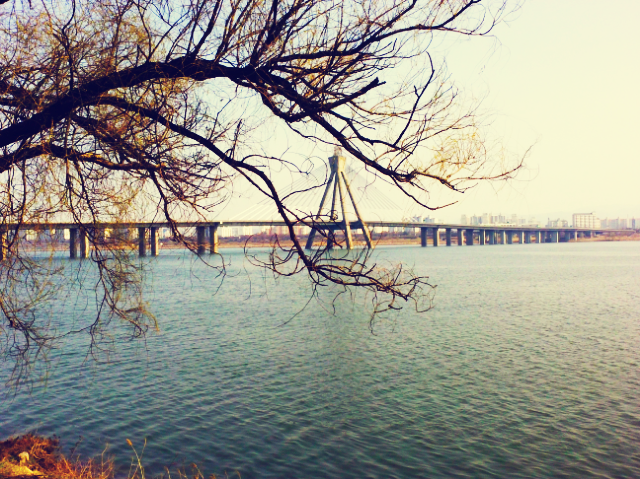 The Seoul Floating Island (3 separate islands) is an artificial island in the river and was built in 2006 after a Seoul citizen, Kin Eun Sung, suggested the project. Kinda cool and random, huh? I love it. 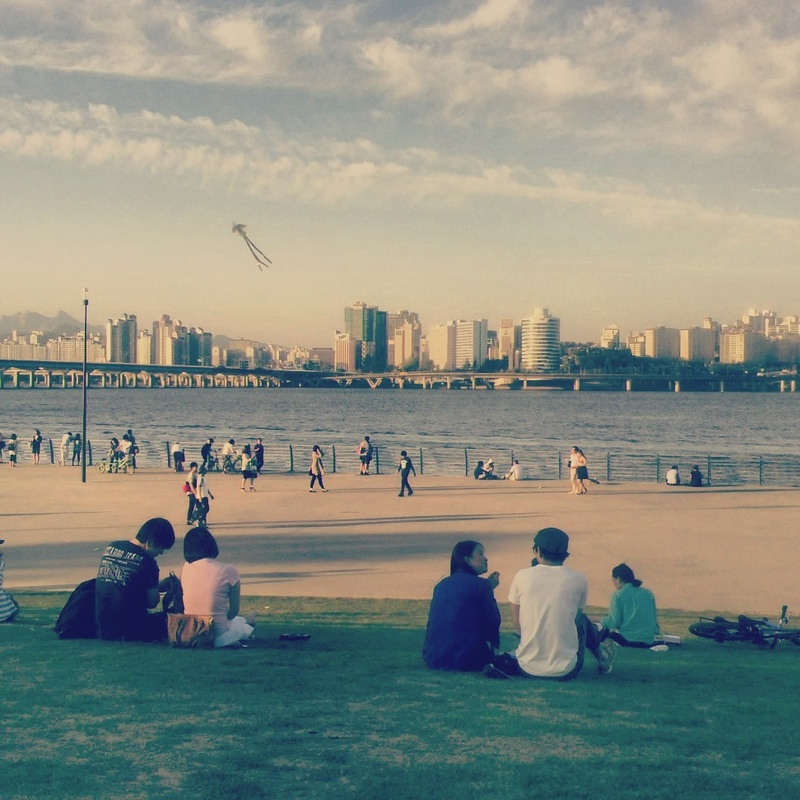 Make your way over to the islands while enjoying the Han River in Seoul. 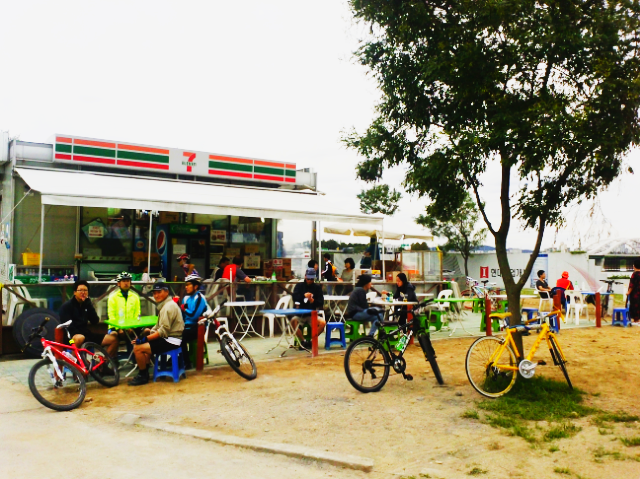 4) Bike, bike some more, stop at a 7-11, and then continue on your bike. 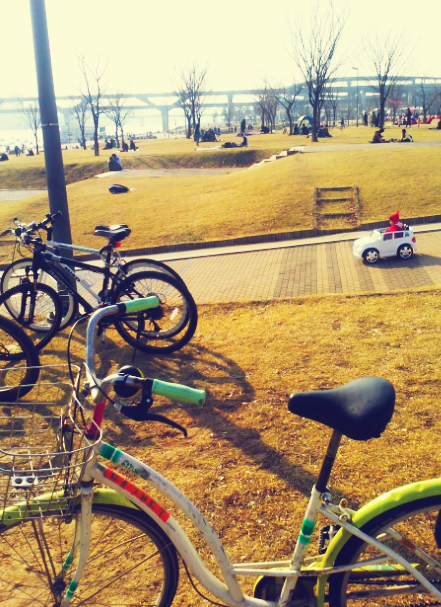 I have yet to rent a bike and enjoy a leisurely Sunday ride along the water. 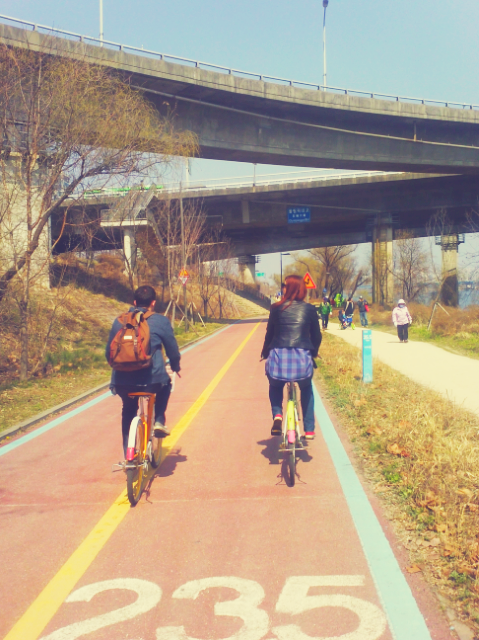 I must do this before I leave Korea. Bikers are always smiling and I want to be one of them. 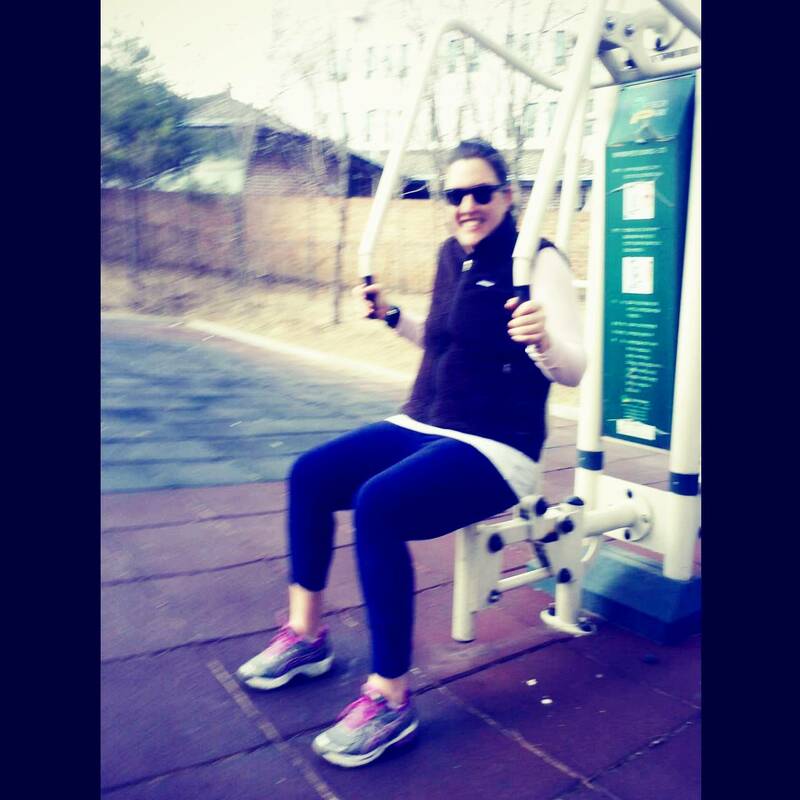 Maybe it’s the endorphins, or perhaps it’s the numerous soju and snack breaks. Either way, count me in. 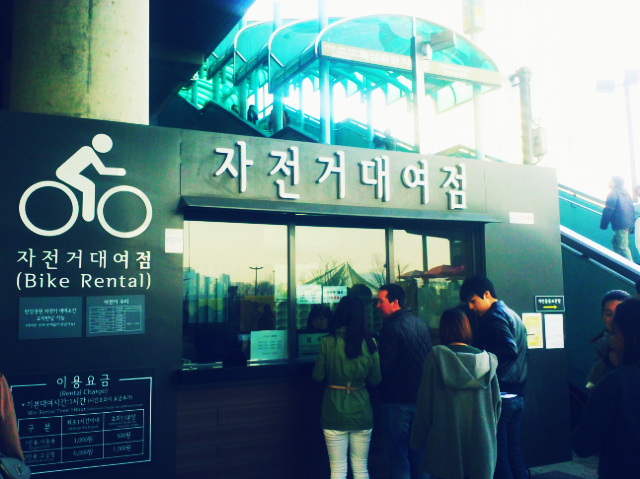 Read here for more information on bike rental spots along the Han river in Seoul. You can easily lounge for hours in the grassy areas along the river. If you need to use a restroom there is usually always one nearby (Just remember to bring your own TP.). Also, if you find yourself and your English teacher friends craving a pizza (or really ANYTHING) you can simply call and order delivery (You may need help from a friendly Korean.) and minutes later a motorbike will arrive at your blanket with food. It’s simply amazing. 6) I’m on a boat. 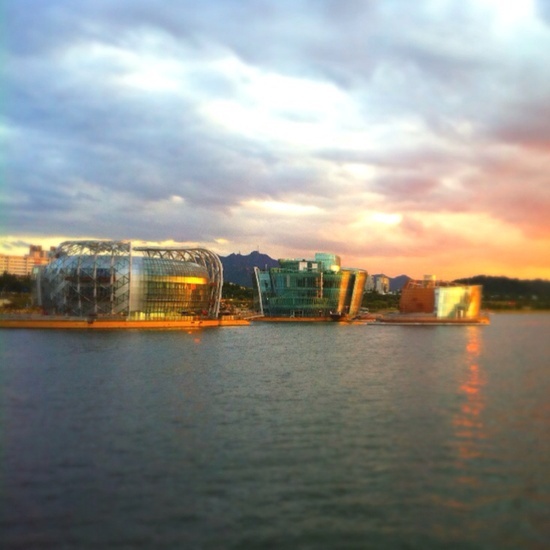 There are many ways to explore the Han river via boat. 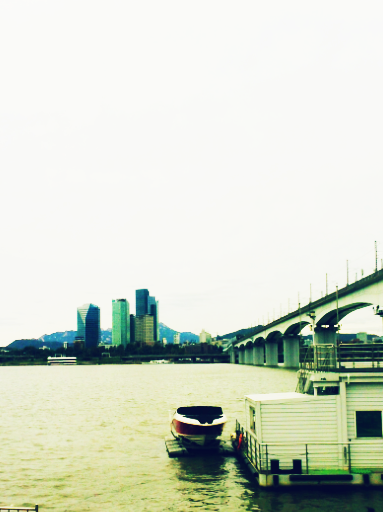 Check out this write-up about a Hangang river cruise through Seoul. 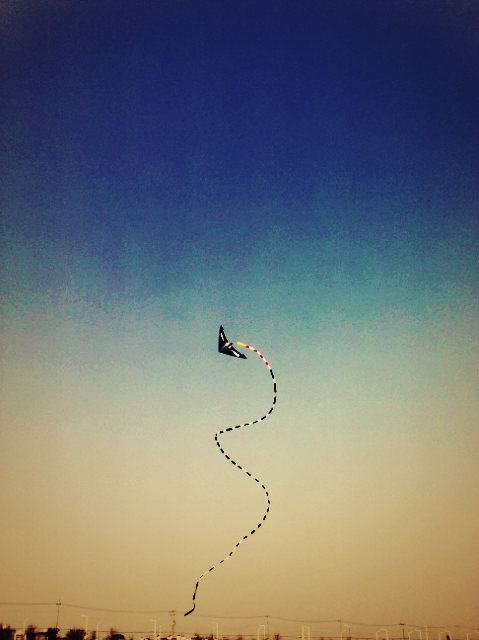 7) Go fly a kite. I know you’re a ‘grown-up’ now, but I promise it’s still fun. 8) I really wonder where they find all the matching outfits. I’m always down to people watch while I relax with a beer in hand and the sun on my face. I love spotting the adorably dressed matching couples strolling along the river hand-in-hand. I’m a sucker for these friendly reminders to take time to stretch. After an activity-packed day on the river you deserve a little TLC. 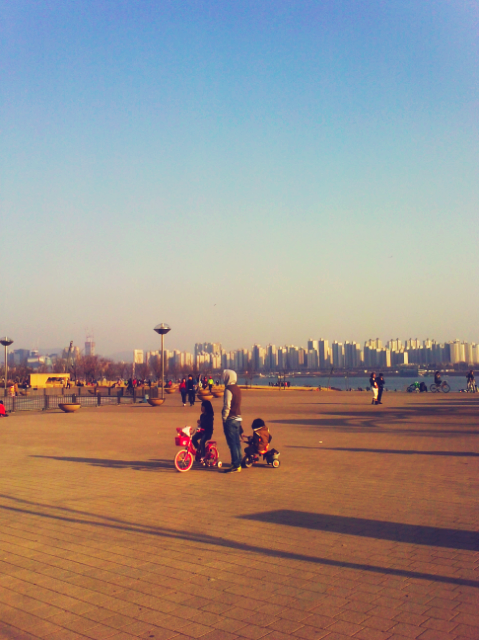 Here is something I promise you will not experience at the Han River. Oh, but you just never know in Korea. I’ve seen some pretty outlandish things. 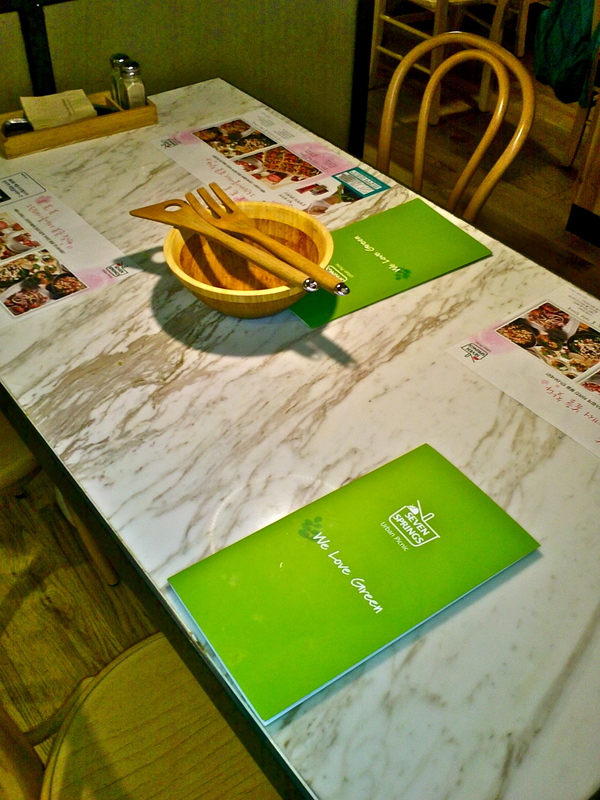 In any Korean restaurant the owners and workers believe that ‘The customer is king’. 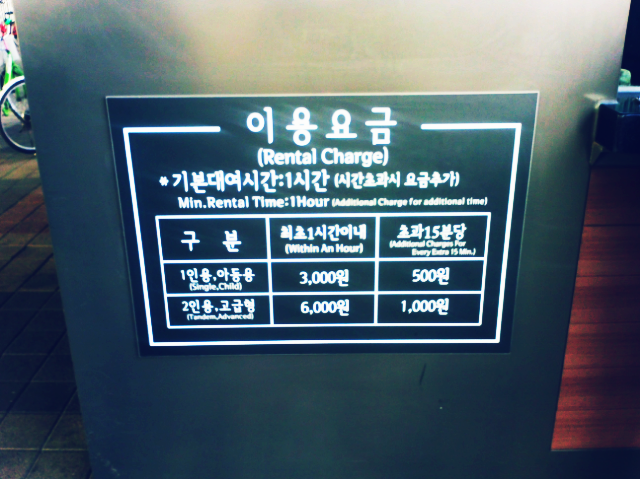 If you are an expat in Korea you are familiar with the word ‘service’ (서비스 – seobiseu). While restaurant workers do not expect tips for their service, they also do not expect diners to wait long for food or have an average culinary experience. I have not had a bad restaurant trip yet. Staff go out of their way to make sure you are happy. ‘Service’ most commonly refers to freebies gifted to customers. I have been gifted beers, bottles of soju and extra orders of barbecue meat. Of course free soju tastes delicious, but when I return home to the US I will most miss the endless supply of Korean restaurant side dishes. As a former waitress I can recall being scolded by management for giving extra honey mustard to customers without adding it to their bill. In Korea this is unheard of. Most meals come with at least 5 or 6 small bowls of delicious side dishes and they are continuously replenished during your meal for free. I could probably open my own store with all the samples I have. 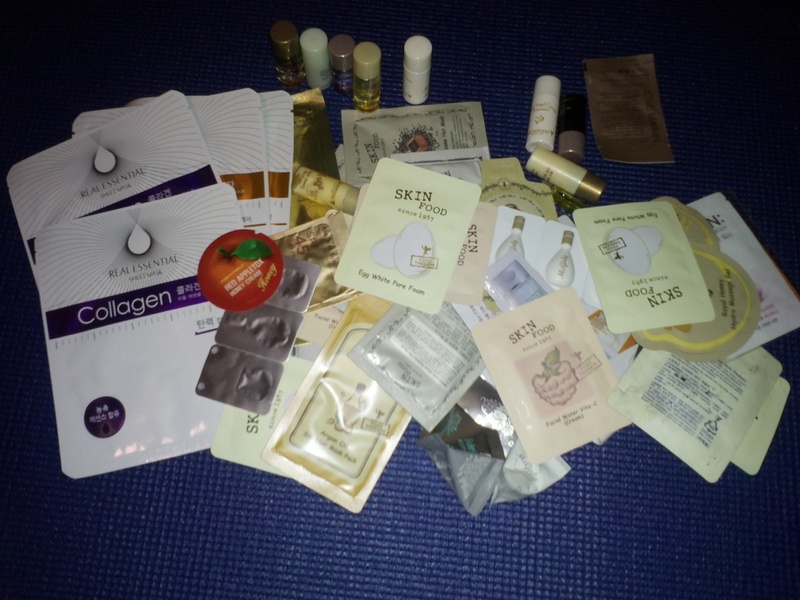 Although I am always using the samples and bringing them on overnight trips, I still have a mountainous supply. Each time I visit a SkinFood or Etude House store I leave with a bag of free samples. Last Sunday night a pleasant man selling fruit out of his truck threw an extra box of strawberries and four oranges in with my original purchase. 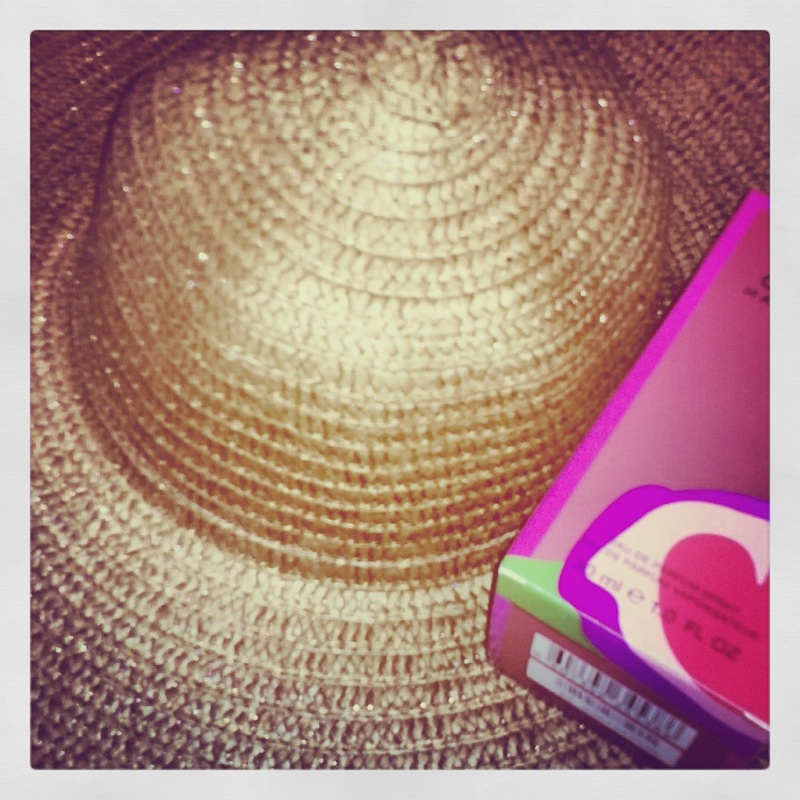 When I bought a new perfume this past summer the saleslady tossed in a straw floppy hat. And many times my local convenience store cashier chases me out of the store because I leave before he can retrieve the free juice drink (or candy bar or soda or pack of gum) I deserve because I purchased a coffee drink (or special snack or energy drink or pack of ramen). Sometimes all the free ‘just because’ gifts can get confusing, but I love them. Korea’s outstanding WiFi is something I will also miss when I am back in the US. Many of my friends choose to not pay for internet service on their smart phones or tablets because they know they can find free WiFi in most places in Korea. Here is a great resource for getting free WiFi anywhere in Korea. Free phone charging still baffles me. 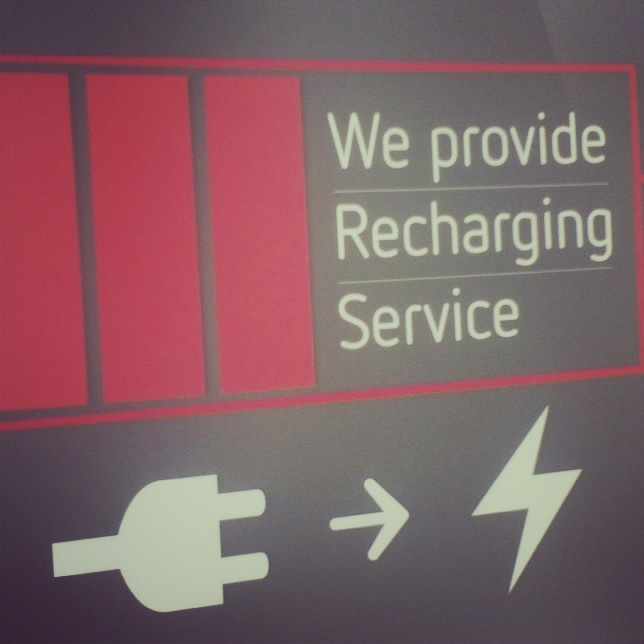 Why wouldn’t stores and restaurants charge for charging stations? I was first introduced to free phone (and device) charging while at a music festival last summer. After a day of map and Google searching, hours of snapping pictures and taking videos, and endless texts to my friends who were scattered around the different music stages my phone was close to dead. I laughed at a sign next to a Vitamin Water booth (They were giving away free Vitamin Waters of course.) that advertised a ‘recharging service’. The festival was on an island and I imagined someone making ridiculous profits by providing mobile phone charger stations. When I heard another concert-goer utter ‘FREE!’ I quickly steered myself to the station. Most bars and restaurants also provide phone charging services for free. 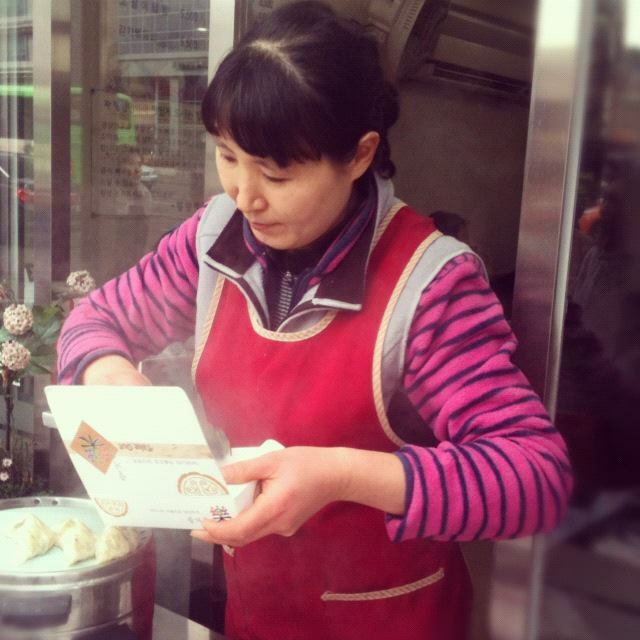 Most restaurants in Korea deliver. And it is amazing. It is fast and free and along with the usual freebie appetizers the restaurant also includes dishes and utensils that you simply leave outside your door when you finish feasting. 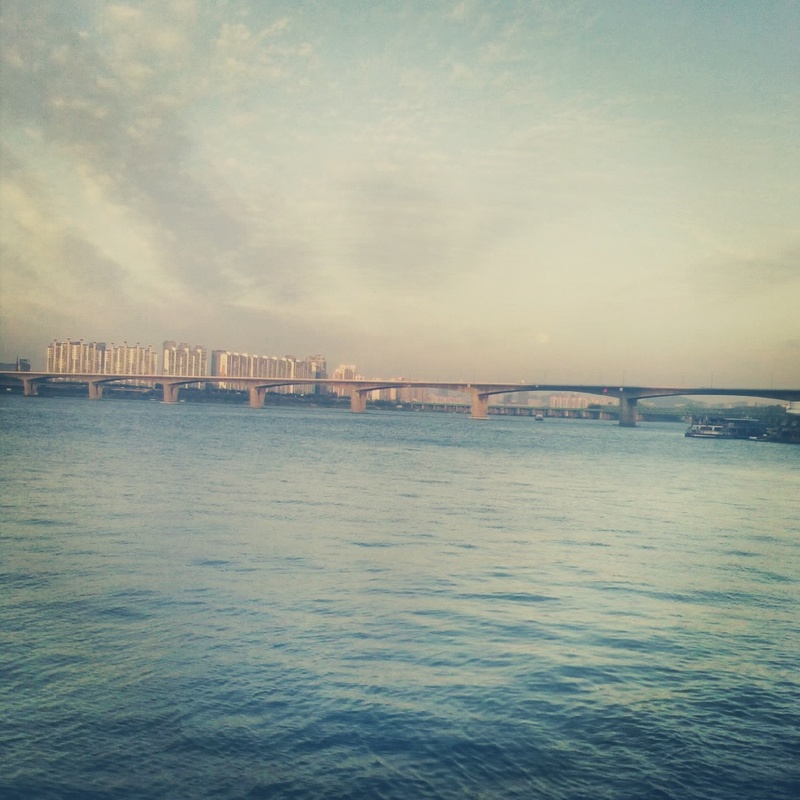 SeoulMate offers free tours of Seoul. 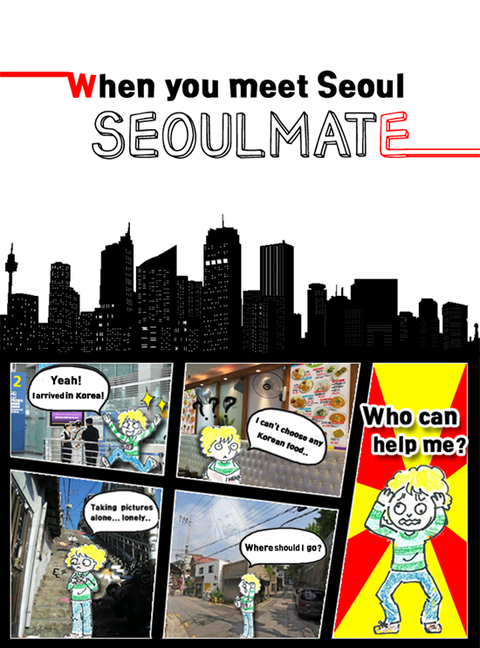 Their website states: We are ‘SeoulMate’, composed of university students that volunteer as special Seoul tour guides to non-Korean tourists for free. 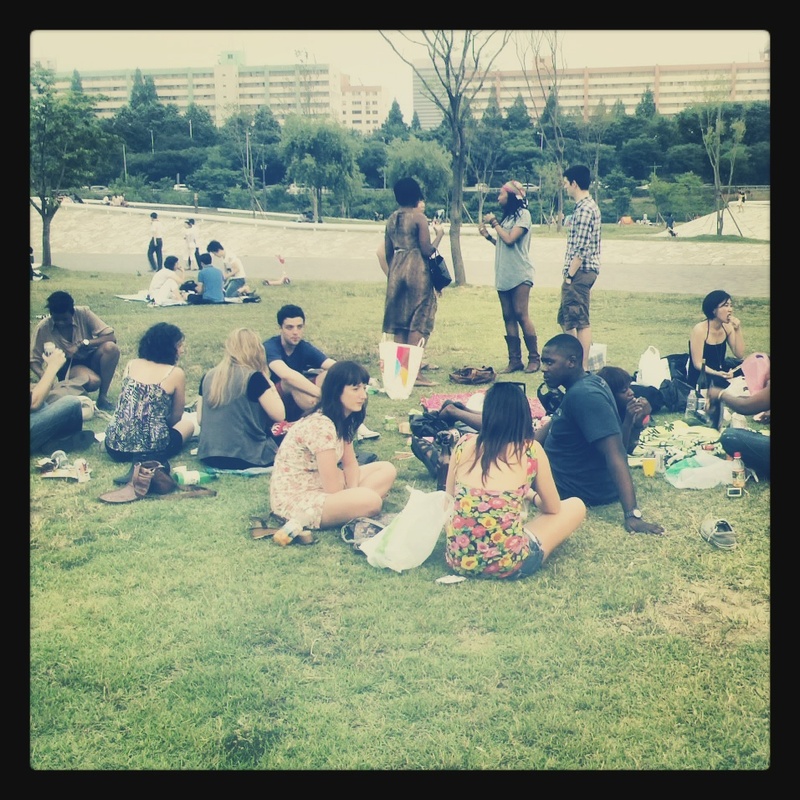 We offer the opportunities for you to make Korean friends and understand the culture of Seoul through our tour programs. Check out their website for the latest tour dates and information. 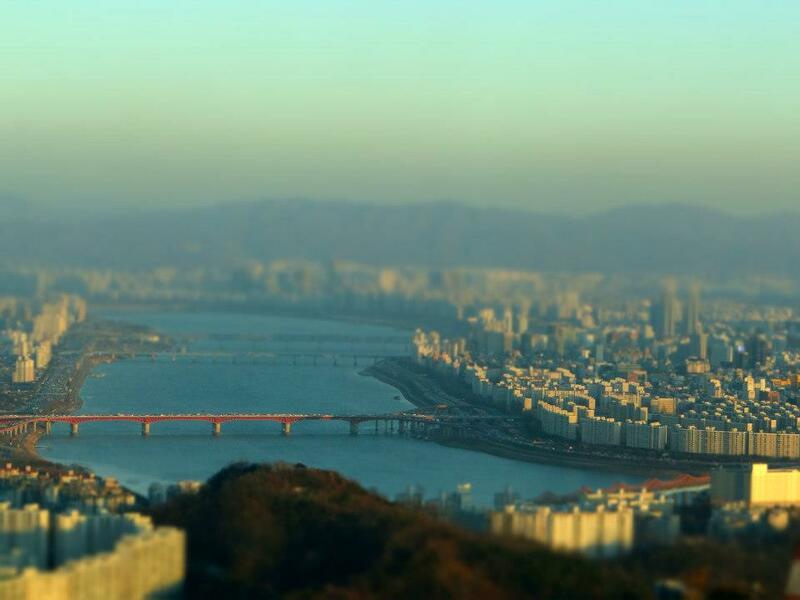 Most museums in Seoul are free or very affordable. I do know the Museum of Contemporary Art is free on every fourth Saturday of the month. The War Memorial of Korea and The National Folk Museum also offer free admission. 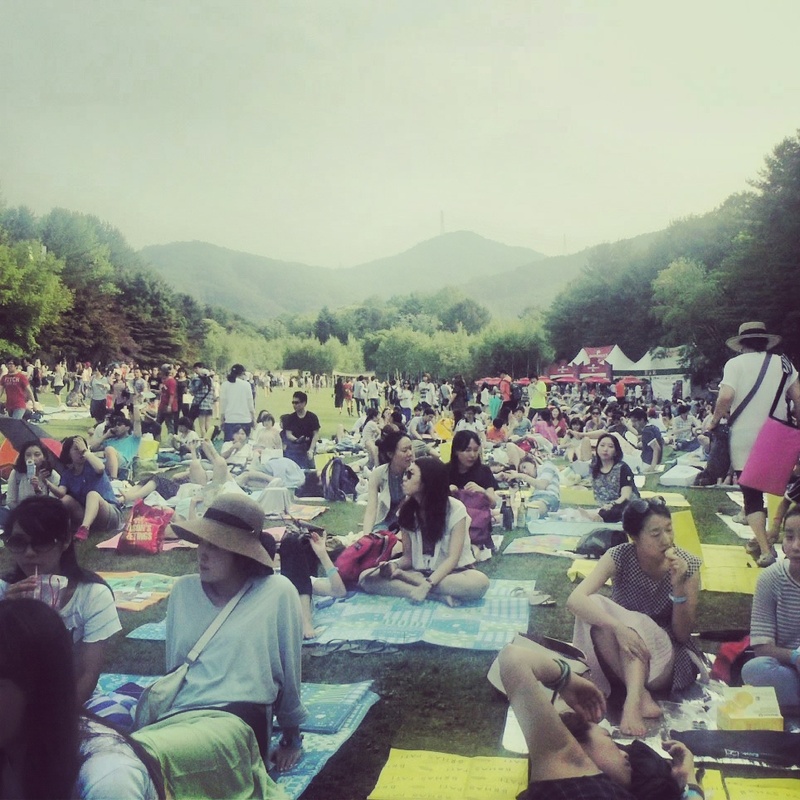 Sometimes it seems as if there is a festival going on every weekend in Korea. 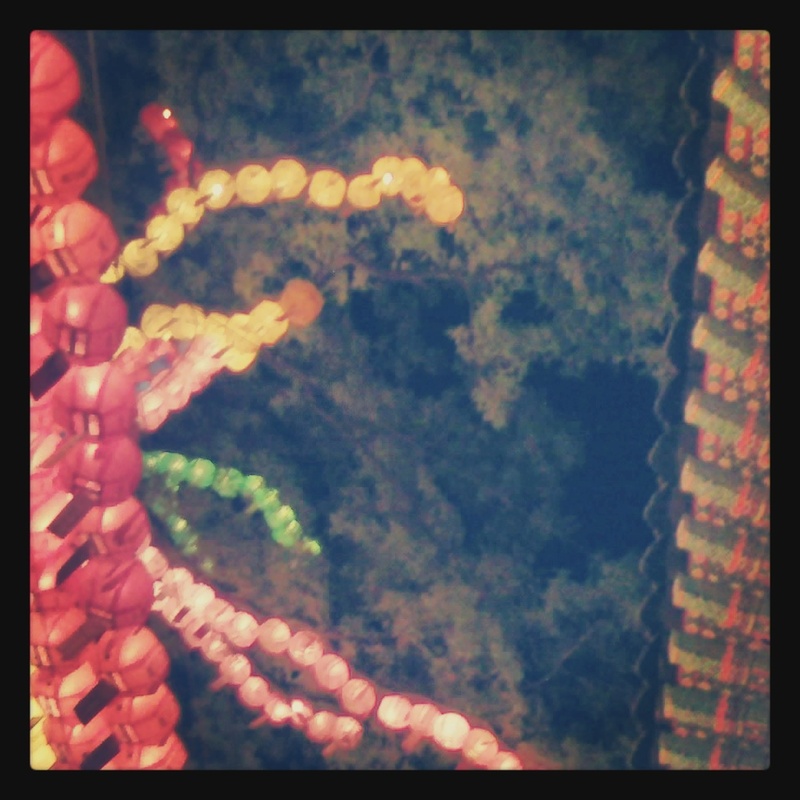 My favorite festival is definitely the Lotus Lantern Festival in Seoul. I spent the weekend in Seoul snapping pictures of the brilliantly colored lanterns, learning about Buddhism at various informational booths, and watching traditional dances, ceremonies and a parade. The entire weekend was free. Here are a few other festivals to enjoy. Promoters in Seoul are constantly trying to give you free things. And there are no obligations. You don’t need to sign up for a credit card or give away your email address. You simply say thank you and enjoy the free gift. Last weekend my friend and I were waiting in line for concert tickets at an almost sold-out Grimes show in Hongdae. With over two hours of standing ahead of us we complained of upcoming fatigue. 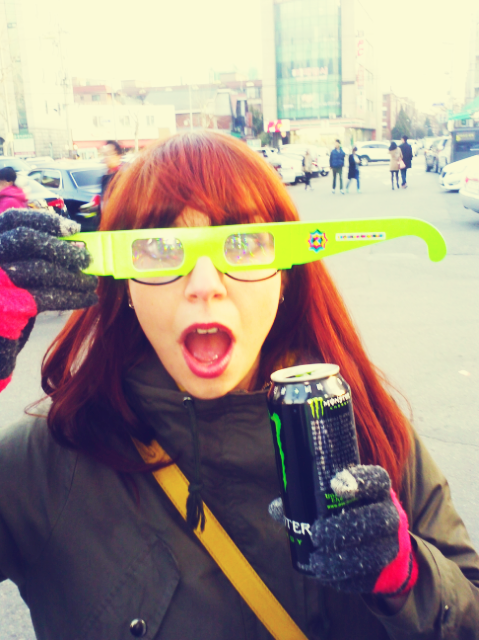 Luckily we scored free Monster energy drinks from a nearby promoter. I love when life works out like that. I should get a gym membership. But why pay for one when you can just use the free equipment scattered all along the river and in parks? I try to make it down to the river to walk or run at least 3 or 4 times a week and there are clusters of decent gym machines for public use on both sides of the water.